If you have decided to spend Christmas in Myrtle Beach, then you have made an excellent choice! Captain’s Quarters Resort is a family-friendly hotel known for catering to the needs of families so naturally Christmas is a time of year that families feel more than welcome. With wreaths, trees and twinkling lights-a-plenty just by walking into this resort you’ll be getting in the holiday spirit. You may have thought that spending a winter holiday, like Christmas, at an oceanfront resort would be expensive. Actually, it’s quite the opposite! 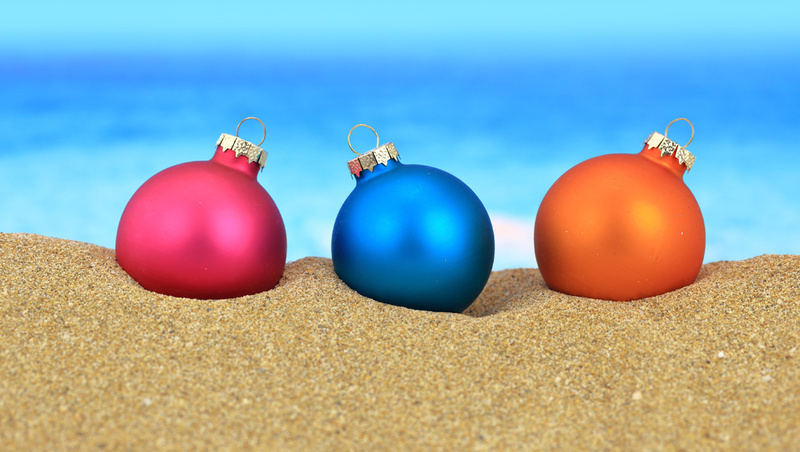 Winter is one of the most affordable times to visit the beach and Christmas is no exception. Christmas rates start at just $49 per night (before taxes and fees), leaving plenty of extra money in your wallet for some last-minute Christmas shopping. Check out our current deals here. The nearby Myrtle Beach Boardwalk is hosting Holidays on the Boardwalk through early January. Walk amongst their twinkling lights and stop by for specially scheduled events including live music, camel rides, Santa appearances and more. If your family loves to visit the aquarium and check out all of the sea creatures, this time of year is one of the best to visit as it is during the Festival of Trees. Ripley’s Aquarium in Myrtle Beach features more than 75 trees, each decorated in their own fashion through the end of the year. Weekends also include Ripley’s Ruckus Drumline and kids can stop by the Guest Service Desk for Ripley’s Holiday Tree Scavenger Hunt. The aquarium is open daily, including on Christmas Day! The Market Common, not far from the resort, is the perfect place to catch up with Santa or take a relaxing carriage ride. Santa’s Workshop will be open for photo opportunities through December 24 (hours vary based on day). You can also catch a free carriage ride between 3 p.m. and 6 p.m. by Dolce Lusso Salon on December 6, 13, 20, 21, 22 and 23. Carolina Roadhouse: Featuring steaks and seafood, this local favorite is open from 11 a.m. to 4 p.m. on Christmas Eve and from 1 p.m. to 9 p.m. on Christmas Day. This restaurant is only about 4.5 miles from Captain’s Quarters Resort. New York Prime: Perfect for steak-lovers, this Myrtle Beach restaurant is open from 5 p.m. to 10 p.m. on both Christmas Eve and Christmas Day and is only about 3 miles away from the hotel. Burro Loco: If you would like to enjoy some Mexican food with flare for your Christmas meal, check out this tasty favorite which will be open from 11 a.m. to 4 p.m. on Christmas Eve and from 4 p.m. to 9 p.m. on Christmas Day. Burro Loco is about 3 miles from the resort. Hard Rock Café: Open on Christmas Eve, this legendary Broadway at the Beach restaurant will be serving up their favorites on Christmas Eve from 11 a.m. to 5 p.m. This restaurant is about 4 miles away from Captain’s Quarters. If you’re considering spending Christmas in Myrtle Beach, there really isn’t a better place to stay that Captain’s Quarters. Check out our Myrtle Beach hotel deals here to get started and start planning your memorable Christmas getaway today and click here to learn more about events in Myrtle Beach!